Raw Linaza Juice. Linseed or Flax Seed Juice. Bolivian Food and Drink Recipes. Raw linasa juice (raw linseed or flax seed juice) is very light and refreshing. It's healthy too! Linseed is full of good nutrition and the best way to enjoy it's full flavor and its healthful qualities is to consume it raw. 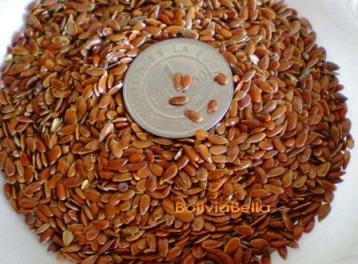 Place one or two cups of the water in a blender along with the linaza and blend until the seeds are very broken. Strain the seeds through a strainer (preserving the water they leave behind in a pitcher or bowl). A LITTLE TIP: If you like to bake, save the ground seed up to 2 days, covered in the refrigerator. Blend them into muffins, whole kernel bread, and other baked goods! You can actually use any sugar you please. I think turbinado gives flax seed juice a nice, special taste. Serve as cold as possible - a little ice is nice! Linaza is one of the most popular juices in Bolivia. Throughout the day you can hear "Linaza, linaza, linaza" being called through the streets as linaza juice vendors walk around selling it. I don't recommend foreigners purchase it on the street because the source of the water used is doubtful and usually the linseed juice sold is raw, not cooked. The first time I was offered raw linaza juice I was very doubtful about drinking it. For some reason drinking seed water didn't sound very appetizing. But I was SO surprised when I did and I think you will be too. It's flavor is mild but really good! Try our other recipe for cooked linaza juice.